Jabra Bluetooth headsets give you excellent audio with increased mobility, simple connectivity, and a clean, wireless experience. 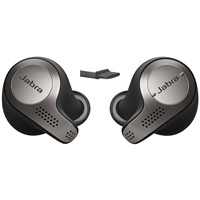 Jabra builds true wireless earbuds that fit comfortably into your ears, providing a natural, worry-free, nearly weightless communications solution. Jabra headsets provide top-tier comfort and audio quality with business features like active noise cancellation and noise spike protection for contact centers and open-plan offices.